[172 Pages Report] The global data exfiltration market size is expected to grow from USD 45.65 Billion in 2017 to USD 89.57 Billion by 2023, at a Compound Annual Growth Rate (CAGR) of 11.7% during the forecast period. The base year for the study is 2017 and the forecast period is 2018–2023. The objective of the study is to define, describe, and forecast the data exfiltration market by solutions, services, organization size, verticals, and regions. 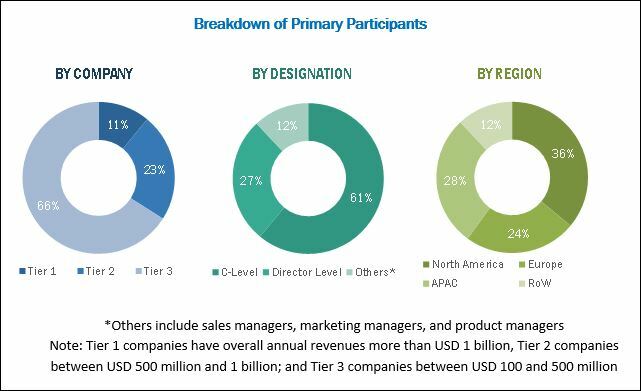 It also analyzes recent developments, such as partnerships, strategic alliances, mergers and acquisitions, business expansions, new product developments, and research and development (R&D) in the global market. The data exfiltration market comprises key vendors, such as Symantec (US), McAfee (US), Palo Alto Networks (US), Fortinet (US), Cisco (US), GTB Technologies (US), Zscaler (US), Sophos (US), Trend Micro (US), Check Point Software Technologies (US), Juniper Networks (US), FireEye (US), Digital Guardian (US), Barracuda Networks (US), Forcepoint (US), iboss (US), Alert Logic (US), Hillstone Networks (US), Clearswift (UK), CoSoSys (Romania), Securonix (US), Dtex Systems (US), HackerOne (US), and A1Logic (US). These vendors provide data exfiltration prevention solutions and services to end-users for catering to their unique business requirements, productivity, compliances, and security needs. 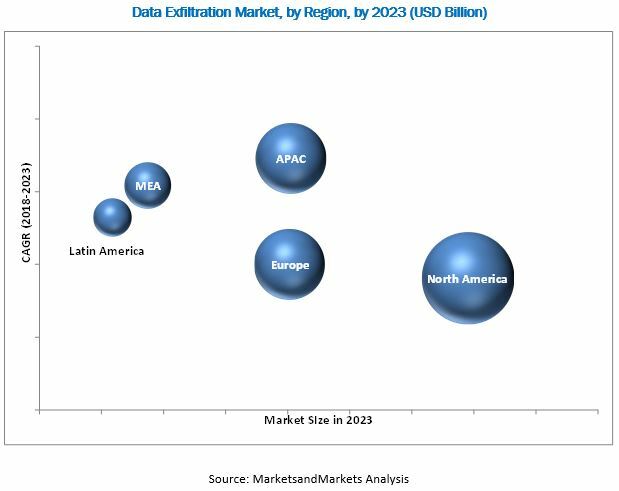 MarketsandMarkets forecasts the global data exfiltration market size to grow from USD 51.47 Billion in 2018 to USD 89.57 Billion by 2023, at a Compound Annual Growth Rate (CAGR) of 11.7% during the forecast period. The growing need for security against increasing bot traffic, along with the rise in the number of smartphone users has led enterprises to adopt data exfiltration solutions for the protection of their sensitive information. Moreover, the Small and Medium-size enterprises (SMEs) are gaining a high traction in the market, as they are more targeted by internal and external data breaches. With the adoption of data exfiltration solutions, organizations can effectively maintain and secure their critical information from data breaches. Data exfiltration solutions help organizations optimize employees’ productivity, protect sensitive data, applications, and comply with stringent regulations. Data exfiltration solutions include various preventing solutions, such as encryption, antivirus/anti-malware, firewall, Intrusion Detection System (IDS)/ Intrusion Prevention System (IPS), Data Loss Prevention (DLP), and User Activity Monitoring (UAM). The antivirus/anti-malware solution is expected to dominate the data exfiltration market and is estimated to have the largest market share in 2018. The UAM solution is expected to play a key role in changing the marketspace and to grow at the highest CAGR during the forecast period, as global organizations are highly proactive toward improving their employees’ productivity and protecting sensitive information from data breaches and malware attacks. The IT and telecom is the fastest growing vertical in the global data exfiltration market, as the vertical has to meet stringent legal and regulatory compliances associated with information security. SMEs continue to deploy data exfiltration solutions, as they are facing malware-based and DNS data exfiltration. Security vendors are offering data exfiltration prevention solutions via encryption, antivirus/anti-malware, firewall, IDS/IPS, DLP, and UAM. As the frequency of security breaches has increased over the past 5 years, organizations have increased their IT security investments to protect against advanced threats. However, for many enterprises, including SMEs, these investment costs are a matter of concern. For a strong and advanced security, the cost of innovation is still high. Hence, many organizations view budgetary constraints as a barrier to the adoption of advanced data exfiltration solutions and services. The increasing adoption of cloud-based solutions and services among enterprises would provide significant growth opportunities to data exfiltration solution vendors. There are several established players, such as Symantec (US), McAfee (US), Palo Alto Networks (US), Fortinet (US), Cisco (US), GTB Technologies (US), Zscaler (US), Sophos (US), Trend Micro (US), Check Point Software Technologies (US), Juniper Networks (US), FireEye (US), Digital Guardian (US), Barracuda Networks (US), Forcepoint (US), iboss (US), Alert Logic (US), Hillstone Networks (US), Clearswift (UK), CoSoSys (Romania), Securonix (US), Dtex Systems (US), HackerOne(US), and A1Logic (US).